There once was a time in my life where I devoted perhaps too much time to writing up a comic starring a hero, made entirely of SPAM, and his never-ending bouts with his arch-nemesis, appropriately named the “Pork of Philadelphia”. It also was not uncommon for me to design yet another iteration of Mr. Soup – a cast iron bowl monstrosity, full of soup, with a knack for filling any role that my sausage fingers could bring to life. You could say my love and adoration for the zany is quite immense, and that is exactly why Feudal Alloy has been on my radar for some time now. Fish-controlled robots in medieval times? Sign me up! As wondrous as it appears on the surface, in all its aqua-mechanical glory, how well does it stack up to the already massive Metroidvania Switch lineup? Attu is a sunflower farmer that takes care of the old and weary in his quiet village. All-natural sunflower oil serves as the fruits of his labor, which he uses on his feeble companions to keep them in tip-top shape, relatively speaking of course. All is well, until a group of fish robot bandits (yes, that is a thing) pillages the area, leaving Attu and the elderly robots in a bad position. A lack of supplies puts Attu’s mission to improve the well being of others in jeopardy – unless he takes action. Armed with nothing more than a rusty sword, he sets out to recover the stolen goods and destroy the opposition in one fell swoop…hopefully. Although the opening cinematic is quite tasty, very little is added to the plot beyond that point. Those accustomed to a more story-driven Metroidvania, like Dust: An Elysian Tail, or those expecting a meaty, lengthy narrative detailing the exploits of fish robots will be sorely disappointed. My personal story desires teetered somewhere between the two, as I would have loved to have seen more done with such a unique concept, but I also don’t expect that much story substance in Metroidvanias anyways. 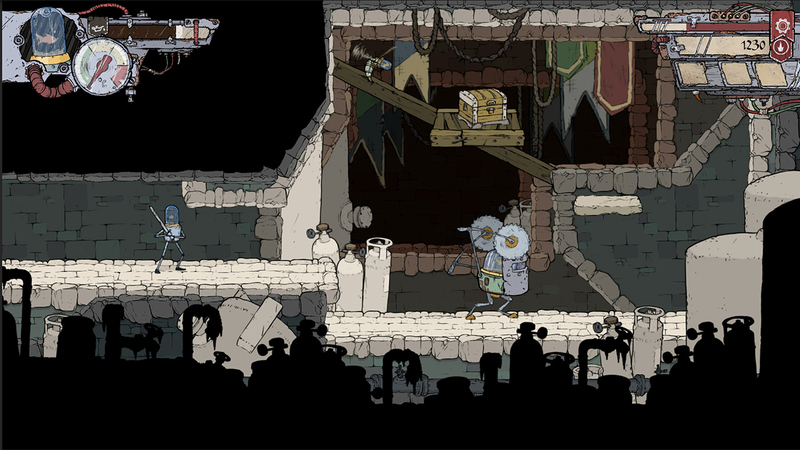 I don’t think that anyone can argue against Feudal Alloy being a beautiful game. 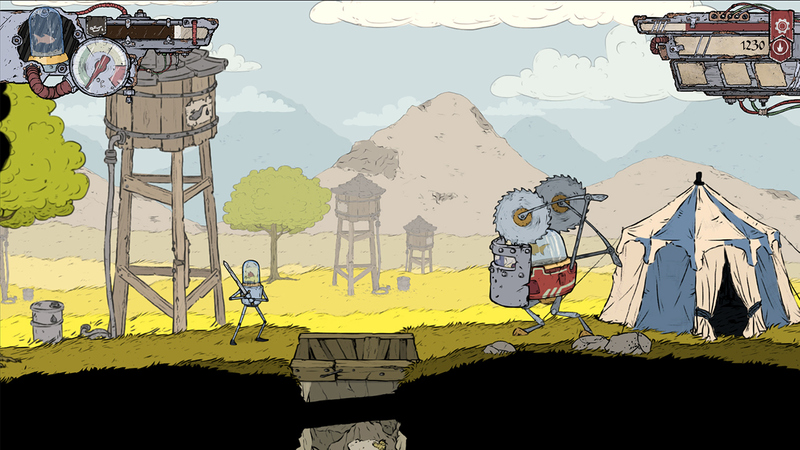 Hand-drawn assets, especially with a refreshing style, have a way of being ageless by design, and Feudal Alloy is no different. All of the various fish-piloted constructs are animated nicely, with bursts of steam, explosions of scrap metal, and oil leaks thrown in for good measure. As wonderful as the assets are in design though, they suffer from growing stale rather quickly. If you are anything like me, you will become tired of the winter-kissed yellow grass and off-white rock formations well before your journey comes to an end, which is a bit unfortunate. There are three (and a half) “biomes” that you will traverse, but all of them sort of blend together due to their similar color palettes. I would have loved to have seen more use out of the outdoor areas, as those were probably my favorite (and least used) of all the scenes. The soundtrack is a bit of a disappointment as well. As thematically appropriate as it might be, it is more akin to the ambiance at a Renaissance festival when you’re hot on the trail of that gigantic roasted turkey leg, rather than something that can be used to really get your adrenaline pumping. 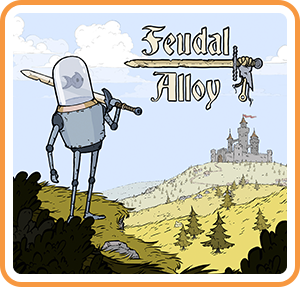 Feudal Alloy does manage to redeem itself from the graphical and audio missteps a bit through its rock-solid performance, but that still won’t prevent you from despising mustard-like colors and Renaissance Festival fanfares before the end of your adventure. 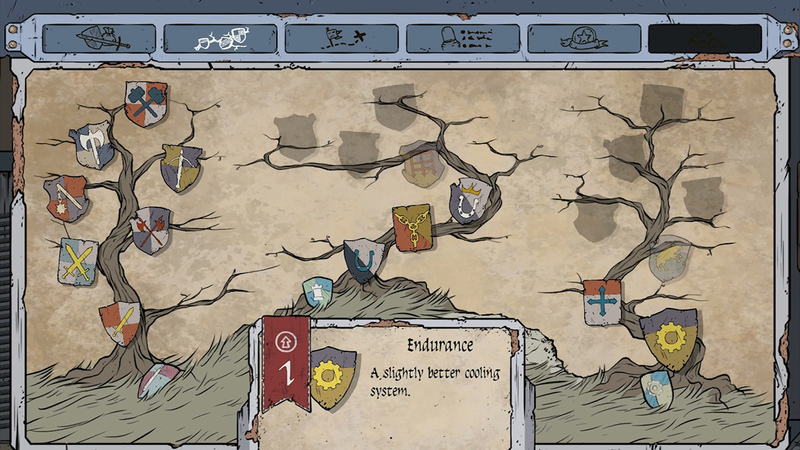 The best and worst of Feudal Alloy comes out with its gameplay systems. At its heart, it is a pretty standard Metroidvania, complete with 2D room-based map progression, backtracking, and secrets aplenty. But as is the case with many gameplay components at hand, it does little to elevate itself beyond the norm. In some ways, it actually takes a few steps back in comparison to your everyday Metroidvania. 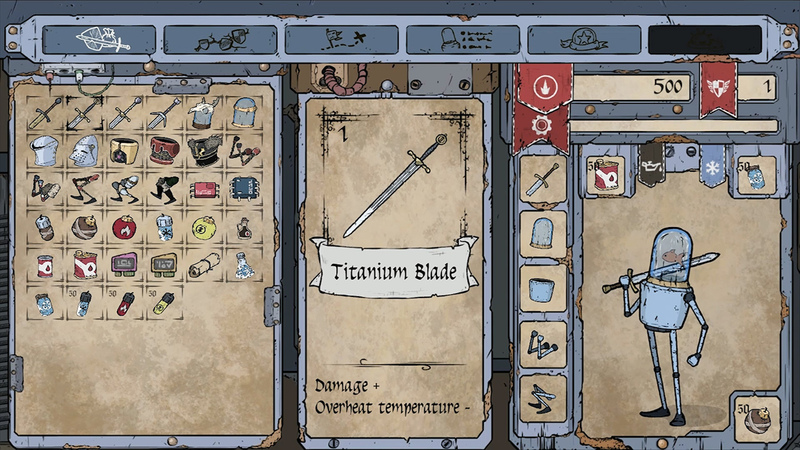 However, things like the cooling mechanic found in Feudal Alloy are a breath of fresh air. Essentially, every swing, block, and some supplementary actions contribute to your core heat level. After a certain amount of actions are executing in succession, your body will overheat for a short time, locking out the majority of your offensive and defensive actions in the process. After a short time you will begin to dissipate heat, or you can chug a coolant vial to temporarily execute heat-free actions (which is WAY more useful than it sounds). This system is both a blessing and a curse because it prevents you from button-mashing to win, keeping you on a constant defense, but often can lead to your untimely demise should the opposition swarm you. While most enemies (and even bosses) have only basic attack patterns, their blows can cumulatively shred you in a matter of seconds. As such, before jumping into the fray, it pays to assess the situation and be prepared for what is to come. In the event that you do die, you return to your last save point with items and accrued funds intact, but you may have a long road back to where your original location due to the sporadic save points. Just don’t be like me and not even realize for a couple hours that there is a handy waypoint system available to you. Attu’s combat repertoire is fairly basic, consisting of standard swordplay, various explosives, and a couple other special moves. These capabilities, unfortunately, are only somewhat bolstered by a relatively uninspired equipment and a talent tree. While I appreciate the inclusion of an actual gear system, complete with various accompanying stat bonuses, it suffers greatly from said bonuses not feeling that satisfying. Really, the first tier of equipment bonuses make such minor difference in your performance that you’ll wonder if they are working at all. Higher tier equipment does feel somewhat better, but there’s no reason why your first experience with finding and equipping gear should feel so bad. Also, comparing gear with your current loadout is more of a hassle than it should be, as there is no indication to what bonuses are equipped without first unequipping the items. This ultimately leads to lots of menu juggling that was not even a thing in 90s RPGs, let alone something from the modern era. The UI and menus look nice – I’ll give the game that – but they could have been more intuitive in many ways. The talent tree is a whole other issue entirely. Instead of interesting perks or additional abilities, you have flat bonuses to damage, health, and cooling system efficiency throughout the majority of the tree. Like the issue with gear not feeling that impactful, these are also underwhelming in the same way. Attu does increase his available actions through finding and installing circuit board chips though. Most of these are your standard Metroidvania fare, such as the ability to double jump and dash, but can also grant the ability to handle explosives and use electrical surges to your advantage. For some reason, electrical abilities are split into three, maybe four individual chips when they probably could have just been one though. The electrical abilities can be used offensively, but are mainly used as a means of destroying certain doors blocking unexplored locations. I don’t know, I just feel like something more interesting could have been done with the design rather than having three separate electrical abilities act as your keyring of sorts. All downsides considered, Feudal Alloy is still a fully functional game. The game runs silky smooth in almost every scenario, the medieval landscapes look nice despite suffering from a lack of variety, and combat can be challenging at times due to inclusion of the cooling mechanic. All classic Metroidvania traversal mechanics are here, but little is done beyond providing that baseline of perks. A fun, lighthearted story with an endearing leading fish is set up, but is not fleshed out enough to really amount to anything in the end. All systems work, but many are marred by questionable design decisions (like the gear and talent tree issues). 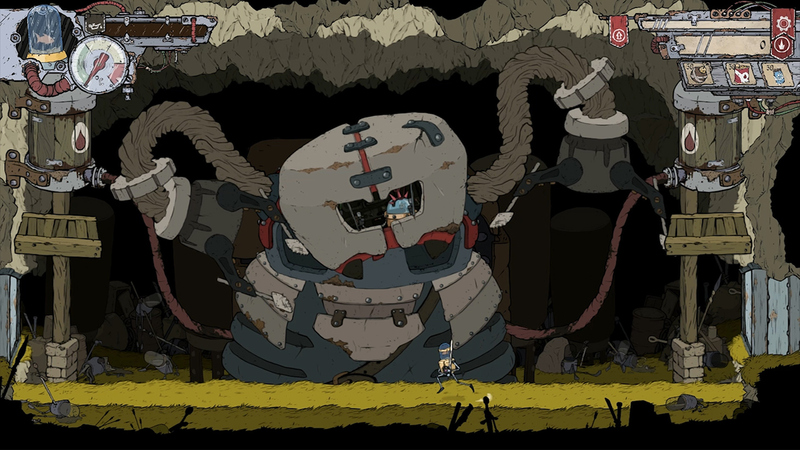 Simply put, Feudal Alloy does little to truly excite a Metroidvania fan outside of its unique aesthetic, and no amount of love for fish-piloted robots will change that. It is still a decent buy if you’re fresh out of Metroidvanias, however. Pity, I was hoping that the gameplay would be as good as the art-style. There are so many metroidvania games out right now that you have to be great in all areas to complete. Might still take a look but will pick it up in a sale or something. Probably a good idea. It is not a bad game by any means, but doesn’t do enough to stand out amongst the sea of Metroidvanias already.